Access to high-speed internet is essential to the overall success of the region, and to growing economic and social opportunities for our residents. And yet our internet infrastructure is far behind what is available in other major U.S. cities, or internationally. High-speed digital service is available only in parts of the region, and is more expensive than in many of the region’s peer metros. In order to achieve ubiquitous and affordable high-speed internet service, public-sector agencies need to coordinate and streamline access to critical infrastructure underground, on the streets, and on rooftops. They must invest in publicly accessible fiber-optic cable, and allow internet providers to innovate on last-mile solutions. The digital divide is also a highly racialized divide; it’s not just an income divide. The internet is already essential for many jobs, homework, research, entertainment, and, of course, connecting with other people. In the future, it will become even more essential. The number of employees who use the internet to work from home grows every year. High-quality, reliable video conferencing may become the standard in a global world. Many medical services will be delivered electronically to improve care and increase efficiency. The region’s infrastructure, such as highways, the electric grid, and buildings, will be powered by the internet. If wielded appropriately, internet infrastructure can be a tool to provide economic mobility, connect people, and make our infrastructure more efficient. But the region is not necessarily on track to achieving that future. Gaining access to the internet can be a challenge for many residents. Over 23 percent of the region’s households lack a wired high-speed internet connection at home, and access is unequally distributed among income levels. Only 15 percent of middle- and high-income households lack an internet connection at home, compared to nearly half of all poor households. Cost is a major factor, with few monthly subscriptions available for under $40 in New York, which can be difficult for many struggling families to afford. As a high-speed, reliable internet connection is increasingly essential for access to educational services, job opportunities, and even healthcare, this can represent a significant barrier to opportunity. Lack of affordable internet access can represent a barrier for others as well. 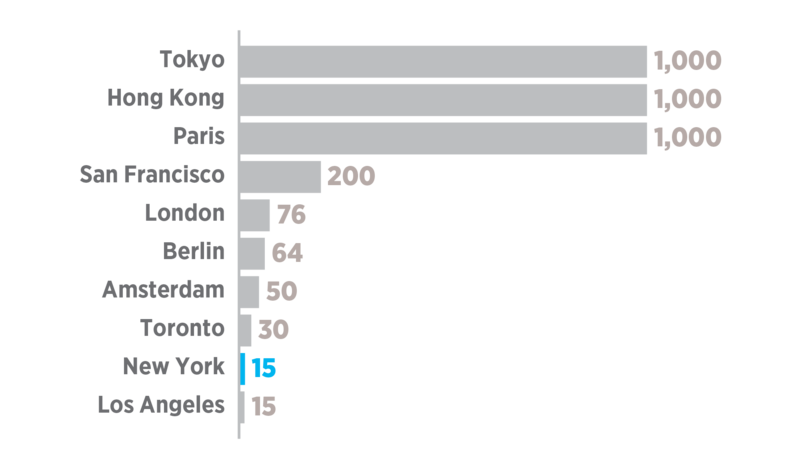 Internet in New York City is far more expensive than in many of its national and international peers. These problems foreshadow what is to come if access to the internet for all types of users is not rationalized and expanded. The internet depends on a physical network of pipes, fiber-optic cables, rooftop antennas, utility poles, and data-storage centers. This physical network—and who can access it—determines the availability and cost of many other services, how equally they are distributed, and perhaps even the kind of information people have access to. There are several reasons this physical network does not provide comprehensive and affordable service. Internet providers are private companies incentivized to serve the most profitable markets first rather than meet the region’s infrastructure needs. Local government has not done enough to enable access across different public and private owners of infrastructure and buildings. Many of the various components that together make the internet—underground conduits, utility poles, rooftops, buildings—can be very difficult to access physically because they are privately owned. Conduit is underground. Buildings are not required to allow access to providers (as they are with other utilities) or be wired for fiber-optic-based service. Without rationalizing and expanding access to the internet and its underlying infrastructure, the region risks falling behind in a world in which everything will depend on the internet. As the region looks to restore its infrastructure and ensure equity, health, and prosperity, it is time to reimagine how internet infrastructure is built and managed. After all, the internet was developed by the U.S. Department of Defense, and its early development was driven largely by government and academic needs. But its broad-based deployment to consumers was achieved by private companies. With lagging and uneven service, it is time for government in the region to take a leadership role in the provision of this increasingly essential infrastructure. This has already been happening in many places across the United States. In a region with so many municipalities and different needs and capacities, no single strategy will work everywhere. But the following proposals can apply in a range of contexts to improve planning, investment, and outcomes. States should proactively incentivize and support publicly owned internet infrastructure and provide technical assistance to local government around data collection, business models, and policy options. In turn, counties and councils of governments, and sometimes municipalities, should take a leadership role in exploring what broadband solutions work for them. And under any scenario, municipalities should ensure fair wholesale access to their internet infrastructure for all users, even when it is privately owned. In locations facing major redevelopment, needing other public investment, or with poor internet service,municipally-provided broadband may be the best course of action. Counties and municipalities could partner to create service districts that have the authority to finance and build infrastructure that could be owned entirely by local government or other partners. These service districts could be financed through private-sector partnerships, with the goal of building public-access networks to a specific building or node. Priority would be given to major redevelopments and low-income areas, and to making infrastructure more resilient in the flood zone. Third-party providers could then compete to supply innovative last-mile solutions, and state and local economic-development agencies could work to incentivize this collaboration. In places where there are sufficient internet offerings, renewed franchise agreements could be an opportunity to expand wholesale access to the internet and increase competition. One of the biggest barriers is the difficulty of accessing the infrastructure. This is particularly true for assets below ground, especially in Manhattan, much of whose web of assets under its streets is more than 100 years old. The challenge has three components: lack of shared knowledge of what infrastructure is located where, lack of coordination on street digging and other related actions, and lack of a publicly accessible conduit that would make it easier for different companies to utilize the underground infrastructure. Together, this represents a big challenge not only to internet access, but also to other utilities, transportation investments, green infrastructure, and better public use of underground spaces. Municipalities should create dedicated authorities to not only issue permits for street work but proactively plan and coordinate between different actors, ensuring “dig once” policies are implemented with maximum efficiency. Any entity that digs up a street should also be responsible for building public conduit and laying public fiber-optic networks. As part of that process, municipalities and other public entities should inventory and open up any public assets—for example, by connecting to the fiber-optic network owned by the MTA. While underground utilities are the biggest challenge to access, other public assets can also be difficult to get to. “One touch make ready” and “dig once” policies can ensure that if one utility is installing infrastructure using utility poles or digging underground, other critical infrastructure work, including the installation of internet infrastructure, is completed as well, saving time and money. Street-design codes can incorporate various points in which to access the conduit and where infrastructure such as Wi-Fi kiosks or small cell towers could be connected. Building rooftops and facades can also be important assets in the installation of mesh networks. Creating a clear process for public use of public buildings and other assets would enable exploration of different technology options. Private assets will also be critical in getting access to the internet. Currently, energy, water, and sewage utilities have the right to access any given property they serve, but that is not the case for internet infrastructure, which hinders its deployment. In addition, just like underground, the building’s own infrastructure is in a state of free for all—with different utilities building separate infrastructure. Building codes and other regulations should be updated to require enabling access to utilities and connecting every place in the building via fiber-optic cable. There is also an opportunity to incorporate new technology needs into building standards such as LEED certifications. Low-income populations face a particular challenge in connecting to the internet. To correct that, an affordable internet option should be built into municipal broadband and franchise agreements. Free internet service should be provided in all libraries and schools. Models for offering free Wi-Fi via advertising could also be combined into a municipal broadband model. Finally, encouraging the creation of mesh networks would provide an alternative, particularly during emergencies. Mesh networks are networks of multiple nodes connected wirelessly to each other to form a web. This design provides resiliency during emergencies because if one node fails, information can be moved through other nodes. The low cost of the infrastructure and ease of installation also make them low-cost to the consumer. Making financing, training, and critical assets available to mesh networks such as on rooftops and buses, municipalities can create a low-cost community-driven alternative. These actions depend on the three states and New York City to create or expand their capacity to plan for internet infrastructure, make investments and finance them, develop innovative business models and partnerships, and manage assets. New York City: Emphasis should be to prioritize investments in public conduit in challenging terrains such as Manhattan, and opening up a digital right of way. New York State: Create incentives and technical assistance for small municipalities to work together. Streamlining the franchise agreement process and helping municipalities band together would reduce red tape. Connecticut: Major capital investments are needed for the state to catch up, in particular, building public-peering points (places where different internet networks can connect). New Jersey: Ensure equal access to utility poles and remove legal barriers to community internet networks. Secondary outcomes should be more competition—and therefore more options and lower prices—around providing internet and related infrastructure. Low-income areas in particular would benefit from more public and private investments in internet infrastructure and the creation of mesh networks as low-cost, resilient options. While investing in the region’s internet infrastructure and related assets requires an upfront investment in both capacity-building and capital investment, it is the type of infrastructure that can pay for itself and even generate new revenues for cash-strapped municipalities. Additionally, because it is inherently easy to share internet infrastructure, there is great potential for public-private partnerships. Exactly how much the region ultimately would pay for this infrastructure would depend on how streamlined a process localities can create to expand internet access. A benchmark cost for connecting a home to the internet via a fiber-optic cable is $1,500. This means that for $6 billion, the same cost as for phase II of the second avenue subway, we could connect half of the region’s households to very fast internet.